While getting a job may not be the most fun thing in the world, it definitely beats getting sucked up into a fire tornado. And you have to do it whether you want to or not. Look, that may not be the most inspiring pep talk in the world, but you know what is inspiring? Money. Getting paid a bunch of money. Though that may not be a given, it is an option for you. Your quest to sell out will also be a lot easier if you're looking in the right place. We recommend looking in one of these cities -- the 15 with the most jobs paying over $100,000 right now. The list comes from Ladders, which puts out reports like this all the time. It's not guaranteed that if you show up on at one of these cities you'll immediately have spontaneous-plane-ticket money, but it certainly won't hurt your chances. As you probably noticed, there's a pretty big difference between the number of opportunities at the top and bottom of the list. San Francisco, in first, has around seven times as many high-paying gigs as the last, Phoenix. But keep in mind that when you're paying rent in the most expensive city in the country that $100,000 won't go nearly as far. And if you're in Phoenix, you can be free of tech bros, something not even Jeff Bezos' money can buy. 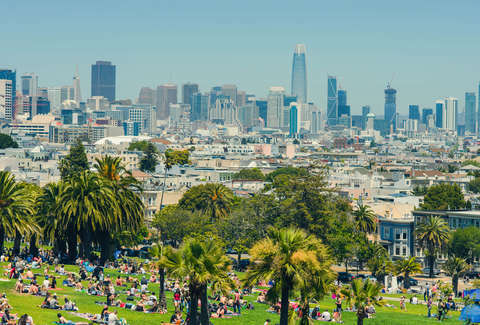 You probably won't be surprised to learn that New York is San Francisco's only real competition when it comes to the presence of these jobs, but anything in the top five still has a pretty significant amount of opportunities. DC and Boston both clear 10,000 and feature jobs like Business Analyst, Full Stack Developer, Database Administrator, and Head of Dermatology. Plus in those cities, the rent will be cheaper and you'll be able to live like a king. Or at least a duke or something. If you're less picky about where you live and just want the money, check out the companies with the most $100,000 jobs right now.